Chili dogs are the perfect “guilty pleasure” comfort food. 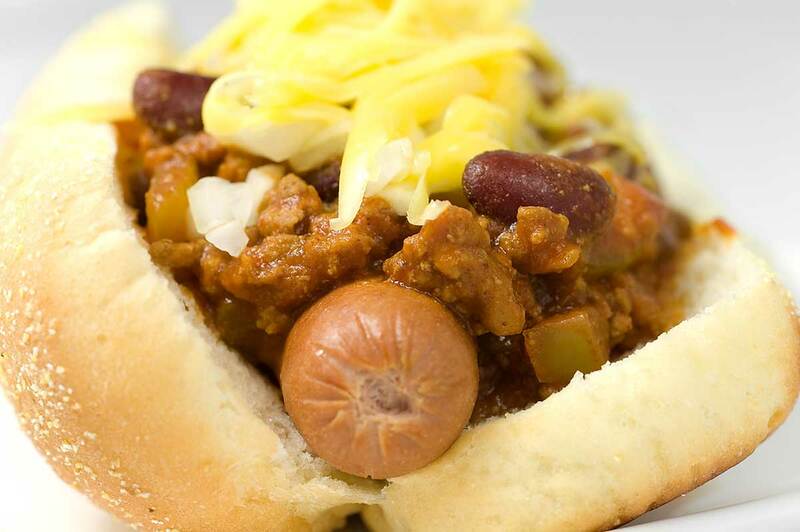 Homemade chili is the key to this easy chili dogs recipe! Happy Labor Day! I may not be in Seattle, but rumor has it that, yet again, it is going to be rainy and cold. This should really come as no shock because it is often rainy and cold here in Seattle. Because of this I have many memories of BBQ-ing hot dogs in the less than ideal conditions of a typical Northwest Labor Day. But instead of the traditional mustard and ketchup toppings, we would make a little homemade chili to warm us up a bit. While I may use the excuse of Labor Day to eat them, I must admit that chili dogs have always been my guilty pleasure. As I’m building them, I think to myself, ” I probably shouldn’t be having a hot dog. I probably shouldn’t be piling chili on top and I definitely shouldn’t be piling cheese on top.” “Maybe I should have a healthy salad instead.” And then I think to myself, “but it is so darn good” and I go for it. And in the spirit of complete and total honesty, I enjoy each and every bite. Homemade chili is the key to the best chili dogs. I have had many a chili dog with canned chili piled on top, but it just isn’t as good as the stuff you can make yourself. Don’t worry, this recipe isn’t one of those “start cooking on Friday, eat on Sunday” chili recipes. Its still full of all of the wonderful goodies like ground beef or turkey, kidney beans, bell peppers and jalapenos, but its quick and you can have dinner on the table in about 30 minutes. What toppings do you like to add to your chili dogs? Come over to my Facebook page and share your ideas! In a skillet cook ground beef, onion, garlic, 1/2 teaspoon kosher salt and 1/4 teaspoon fresh cracked pepper. Once meat is browned, transfer to colander . Reserve 1 teaspoon pan drippings. In the same skillet, cook green bell pepper and jalapeno in reserved pan drippings for 3 minutes until slightly softened. Return ground beef mixture to the pan. Add remaining ingredients, stir to combine. Bring to a bowl. Reduce heat and simmer for 30 minutes. Place hot dog in bun, spoon hot chili over the top. Top with shredded cheddar cheese and onions. Serve. We had just plain ole hot dogs yesterday. Should have made these instead! ohhh perfect labor day treat! Oh wow,s looks like such a perfect lazy-day indulgence! Great for a Labour Day BBQ to enjoy the last few days of summer!